Hello, my name is Erika. I am 17 years old and I stay in Georgia. When I grow up I would like to be a hair-stylist. My favorite sports are soccer and dancing. My dreams are to attend college and some day have a family. I would also like to travel all over the world. God loves you and God bless you and your family. Thank you for thinking about helping me raise the money to get the transplant that I need. Family and friends of Erika Hernandez-Garcia are raising money to pay for uninsured medical expenses associated with her kidney transplant. 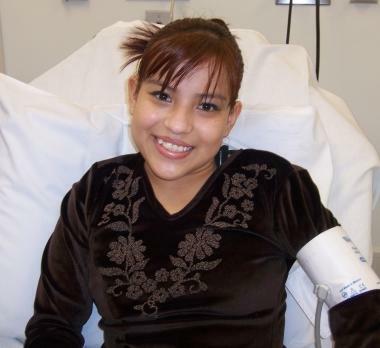 Erika lives in Stockbridge, GA and is being treated at Children’s Healthcare of Atlanta at Egleston. Erika has chosen to fundraise with HelpHOPELive in part because HelpHOPELive provides both tax-deductibility and fiscal accountability to her contributors. Contributors can be sure that funds contributed will be used only to pay or reimburse medically-related expenses. For more information, please contact HelpHOPELive at 800-642-8399.